There is this great idea that if you look hard enough and long enough at any region of space, your line of sight will eventually run into a luminous object: a star, a galaxy or a cluster of galaxies. In reality, the universe is finite in age, so this isn’t quite the case. There are objects that emit light from the past 13.7 billion years—99 percent of the age of the universe—but none before that. Even in theory, there are no stars or galaxies to see beyond that time, as light is limited by the amount of time it has to travel. But with the advent of large, powerful space telescopes that can collect data for the equivalent of millions of seconds of observing time, in both visible light and infrared wavelengths, we can see nearly to the edge of all that’s accessible to us. The most massive compact, bound structures in the universe are galaxy clusters that are hundreds or even thousands of times the mass of the Milky Way. One of them, Abell S1063, was the target of a recent set of Hubble Space Telescope observations as part of the Frontier Fields program. While the Advanced Camera for Surveys instrument imaged the cluster, another instrument, the Wide Field Camera 3, used an optical trick to image a parallel field, offset by just a few arc minutes. Then the technique was reversed, giving us an unprecedentedly deep view of two closely aligned fields simultaneously, with wavelengths ranging from 435 to 1600 nanometers. 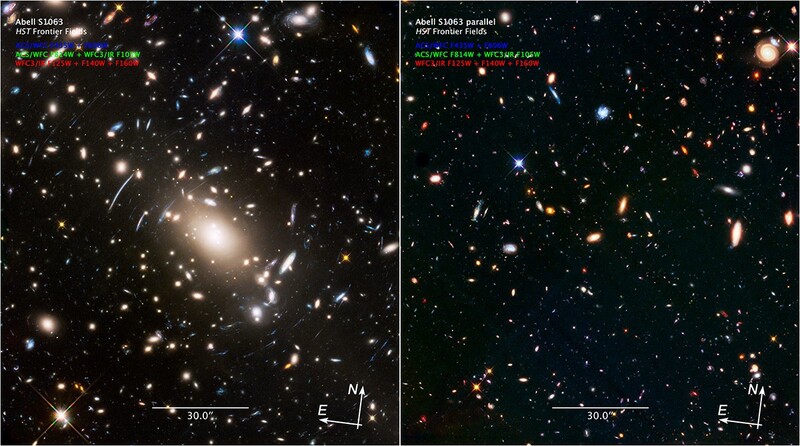 With a huge, towering galaxy cluster in one field and no comparably massive objects in the other, the effects of both weak and strong gravitational lensing are readily apparent. The galaxy cluster—over 100 trillion times the mass of our sun—warps the fabric of space. This causes background light to bend around it, converging on our eyes another four billion light years away. From behind the cluster, the light from distant galaxies is stretched, magnified, distorted, and bent into arcs and multiple images: a classic example of strong gravitational lensing. But in a subtler fashion, the less optimally aligned galaxies are distorted as well; they are stretched into elliptical shapes along concentric circles surrounding the cluster. A visual inspection yields more of these tangential alignments than radial ones in the cluster field, while the parallel field exhibits no such shape distortion. This effect, known as weak gravitational lensing, is a very powerful technique for obtaining galaxy cluster masses independent of any other conditions. In this serendipitous image, both types of lensing can be discerned by the naked eye. When the James Webb Space Telescope launches in 2018, gravitational lensing may well empower us to see all the way back to the very first stars and galaxies. This article is provided by NASA Space Place. With articles, activities, crafts, games, and lesson plans, NASA Space Place encourages everyone to get excited about science and technology. Visit spaceplace.nasa.gov to explore space and Earth science!